Getting into the housing market is a challenge for many people, but the data shows it’s not as difficult as sometimes presented, particularly in a city like Adelaide. Too often the only time we hear about housing affordability in Adelaide or nationally is when another report is released on just how difficult things have become for first home purchasers and tenants. It is true that housing costs are a major challenge for many people, with too many households spending more than 60% of their income on housing costs. It is to Australia’s shame that it is not the wealthy buying their mansions who forego such large portions of their income to cover the costs of their housing – rather, it is those most vulnerable. Housing affordability problems are concentrated among sole parent households, persons affected by a disability, those on low incomes or out of work, and, increasingly, older private renters. But not everyone in the housing market is in dire circumstances, nor are all parts of the country affected equally. Recently Bankwest released a report on housing affordability that estimated the time it would take first-time buyers to save a deposit for a home. To make it simple, they assumed there were two people in the household, earning average incomes for those aged 25 to 34 and saving in a high-interest account the 20% deposit they would need to become owner-occupiers. Clearly, not every household in Australia is comprised of two income earners without children, but the data provides a useful baseline to consider access to home ownership. The Bankwest report focussed on the growing gap between the eastern and western parts of Australia in terms of access to home purchase. In Perth, it would take a household just 3.9 years of saving to buy their first home, while in Sydney it would take 8.2 years to get into the market. There was good news for South Australia and its residents: people in Adelaide needed to save just $90,000 – the lowest of any mainland capital – to get into a new home, and Bankwest calculated that it would take just 4.2 years of saving. More critically, households happy to move to the outer northern or outer southern suburbs on average income could get into the housing market in under four years. In many parts of regional South Australia, it takes under two years. The Southern Mallee, Tatiara, Cleve and Whyalla are especially affordable locations. Looked at objectively, the time taken to save to enter home ownership in South Australia should not be off-putting. Those who argue that it is now too difficult for younger households to gain a foothold in the housing market are overlooking the challenges confronting earlier generations of home buyers. Until the mid-1980s, would-be home buyers had to save a substantial deposit –which could be a third of the total – and demonstrate a track record of saving with one institution, and often they did so on just one income. In the 1990s, interest rates for building societies and similar institutions escalated, reaching 18% for a short period. Home ownership has never been easy, nor has it come quickly for most home buyers. In 2011, I published research with my colleague Dr Debbie Faulkner that looked at the percentage of individuals to enter home ownership by a particular age (see below). What the data shows is that a lower percentage of older Australians were home owners at every stage of life than younger Australians. Only 42% of those aged more than 75 during the survey had been home owners at age 30, compared with 52% for those aged 55-64 and 57% of those aged 35 to 44. 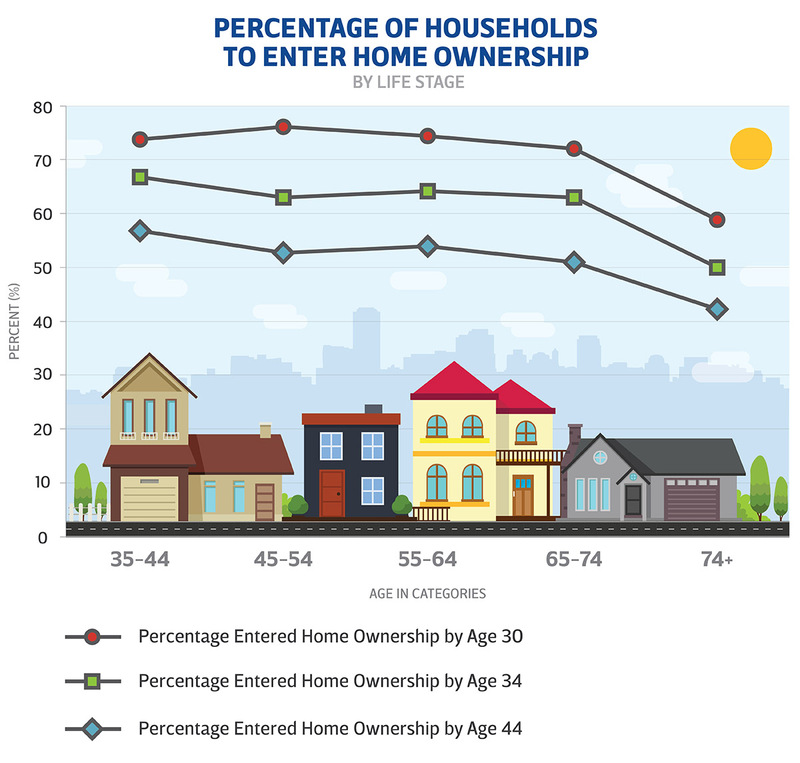 Similarly, by age 44 some 60% of those aged 75 or older were home buyers, compared with 74% of individuals aged between 55 and 64 and those aged 35 to 44. So what does this tell us? First and foremost, it shows that it is not all gloom and doom in the housing market: couples with two incomes can get into the housing market relatively quickly and look forward to secure and affordable housing. Second, we need to acknowledge that while many other households experience real hardship in today’s housing market, we can take some comfort from the fact that earlier generations of Australians have been confronted by comparable difficulties and came through to enter home ownership. Governments should, of course, do all they can to help these individuals and families. Finally, we can never lose sight of the fact that access to home ownership depends on being in receipt of a good income, which for most of us means having a job. As a state, there is value in everything we do that brings jobs to our cities and regions, and which gives all of us the income to be secure in our housing. Andrew Beer is Dean of Research and Innovation at the University of South Australia Business School.